I’ve been meaning to post this blog entry for some days now. But I keep stumbling over my words. Fearghus O’Conchúir’s Tabernacle has proven to be a show that I have felt compelled to tell everybody about yet have come up stuck for words each time. And it would seem I’m not alone in chiming in with my praise for this particular performance, yet it is the first time since becoming part of this project that I’ve felt that my attempts at any sort of academic review or critical jargon cannot substantiate O’Conchúir’s work. But none of this really mattered at all when I went to see the premiere of Tabernacle last Friday at the Project Arts Centre. To observe O’Conchúir’s work without any of my predetermined notions of the intricacies of dance allowed the pure brevity of his piece to flow beautifully. A quick glance at the programme for Tabernacle and you’ll see mention of a wider framework; ‘the Catholic church and the making of the Irish body,’ and your mind will indefinitely conjure up its own assumptions. What O’Conchuir excelled in here however was presenting an honest, articulate and open performance that, rather than seeking to tell a narrative, expanded on an open discussion of the role of the church in the construction of the body. Not once did this work ever appear didactic or forced, instead it expolored a very real resonance between religion and the personal, and encapsulated its significance in the our present. 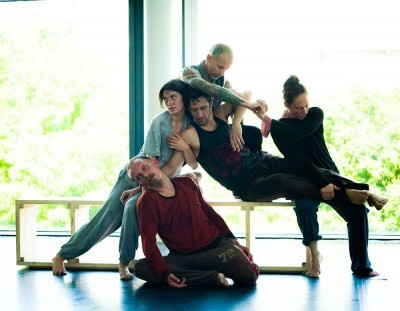 This very spirit of translating a theme so weighted in reference and debate without deviating into a subjective commentary is something which has been at the core of O’Conchuir’s work since its inception, and it’s something that is key in making his choreography so emphatic with an audience. Tabernacle has consistently acted like an open forum that in a way has been curated by O’Conchuir himself. He has actively encouraged an interaction with his work in progress, which in turn feeds back into his own creative output. Perhaps most obviously this can be seen in the collaboration with composer Iarla O’Lionáird and visual artist Sarah Browne. But it certainly didn’t end there. Over the course of the work’s development O’Conchúir opened his rehearsals to the public and invited thoughts and comment before it ever even seen the stage. It’s hard to pin down exactly how O’Conchuir weaves everything together into his choreography; on one hand it seems almost academic in research, on the other it’s like a magpie collecting with precision, yet on hearing O’Conchuir speak of his work there is a sincerity in his approach of channelling his own ideas through an enthusiasm of shared debate and creativity. Most powerful of all in Tabernacle is how, through all of these processes and collaborative efforts, he has produced a brave new work that is entirely honed and cohesive. There is a distinct vunerability to Tabernacle that underpins an honesty in the movement of the performers as each individual explores their purpose and comes to terms with their own selves. And yet a quiet resilience prevails. The tangible quality of their individual quests progresses through the space and through collective construction, as the group work with and against eachother, and ultimately accumulates in their movements falling back into the individual rhythm of their own bodies. Tabernacle doesn’t extol or confront an audience with definitive concepts on the Catholc Church, but it refuses to shy away from it either. It’s a intricate balacing act that O’Conchúir has executed superbly, and more to the point, in a subtle and probing manner. This performance captures the process of how religion as a wider thematic structure provides a basis for the composition of ideals; how the individual learns, explores, manipulates or takes solace within this structure and how this layering of social and personal memory is reflected in the body.